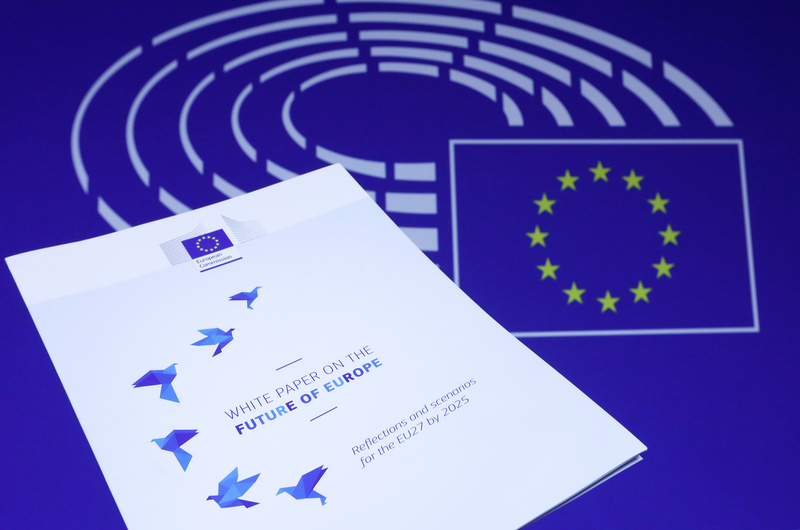 Illustration photo shows the cover page of the White Paper on the Future of Europe, which was presented before the European Parliament on Wednesday by the European Commission President Jean-Claude Juncker, is seen in Brussels, Belgium March 1, 2017. On 1 March, the European Commission published a White Paper laying out five different scenarios for the future of the EU27 (thereby presuming that the post-Brexit Union of 27 member states will hold together). Four out of the five scenarios foresee that closer defence cooperation, in one form or another, will be an important priority. Judging from the overall thrust of the paper, gone are the days when the only way forward was for the EU to do more – according to the bicycle metaphor sometimes used to describe integration, one had to constantly keep pedaling in order not to fall. Brexit has made the option of moving backwards very real. The five options include ‘carrying on’ without major change, downscaling the EU to ‘nothing but the single market’, moving towards multi-speed integration, deepening some areas while downscaling others, and building a federal Europe (although the paper does not use the ‘f-word’). Instead of openly arguing for ever-deeper integration, which the Commission has usually done, it calls on member states to reflect on and choose their favoured scenario. The paper actually presents ‘renationalisation’ of some policy areas as one possible path to take. Against this backdrop, it is remarkable that defence is singled out as a promising area of cooperation in most of the scenarios. This obviously reflects the dramatic worsening of Europe’s security environment in recent years as well as the shared understanding across the EU that one should stand together in addressing threats from the East and South. 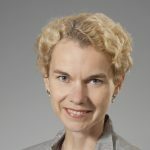 The focus of EU debate on security and defence has shifted away from crisis management and become much broader than the relatively narrow mandate of the Common Security and Defence Policy. The EU Global Strategy of last year talks about ‘protection’ (indeed, not ‘defence’!) of the EU and its citizens, joint efforts to strengthen Europe’s defence capabilities, and cooperation on cyber and energy security. In the European Defence Action Plan published in last December, the Commission outlined its ideas for supporting defence industries, research, and possible joint procurements, depending on member state interest. Never before has the Commission aspired to play an active role in the field of defence. als in a separate ‘reflection paper’ on the future of Europe’s defence, to be released later this year. At the moment, what seems clear is that the EU does not foresee taking on the task of territorial defence, and more generally wants to avoid competition with NATO. Even in the most ambitious scenario, a ‘European Defence Union’ would be established ‘in full complementarity’ with the Alliance. Some other scenarios envision more cooperation in developing military capabilities and in improving the EU’s ability to conduct operations abroad. To some extent this is already being done, for example by the ‘Military Planning and Conduct Capability’ unit for EU-led military training missions, which the EU foreign ministers just decided to establish. For the time being, the MPCC is as close as the EU can get in practice to having a military headquarters of its own. In all, the proposals are not revolutionary, and do not promise any fast improvement to the EU’s contribution to European security. Decision-making on security and defence will remain firmly in member state hands, and the differences between national priorities and strategic cultures will not go away. While the Commission has not openly backed any particular scenario, the French and German foreign ministers were quick to come out with a statement welcoming the White Paper and indicating a clear preference for a multi-speed Europe. This is also rumoured to be the option favoured by the Commission. If the elections to be held in both countries later this year will produce a pro-EU outcome, France and Germany will most likely make a strong push for this scenario to materialize. Expect a difficult balancing act between the urge of several member states for much closer defence cooperation on the one hand, and the aim to maintain the EU’s unity, strongly underpinned by Germany, on the other.